I am always responsible for everyone I fly. I am their protector in all ways and even if I have to struggle, I try to find some thread to connect me to them, to care about them. It is my duty to bring them back safely and most flights that is where our relationship ends. But some days I have the greatest feeling of joy knowing I will care for someone truly special, someone who will always be with me, imprinted on my data plate. I stood in my hangar and replayed that day in March four years ago, as if it was yesterday. 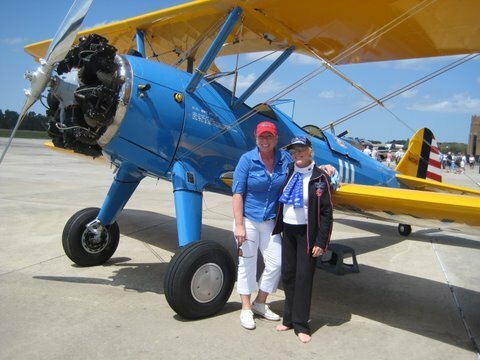 That afternoon I loaded Florence into my Stearman and watched her climb up the wing, barefoot and ponytailed. It was as if I was watching an eighteen year old student pilot climbing into her Stearman at Sweetwater, Texas for her first training flight. She beamed, shy but fearless and just happy for the chance to fly. After all the photos were taken of the WASP’s together around my plane we taxied off the ramp into the grass and put our arms up, straight up to the sky, and cheered to us. Two gals flying together about to go on a great adventure. “Yahoo!” Florence yelled. At lunch she had told me she was worried she would be sick or worse, scared. I took her hands in mine and I promised I would take the very best care of her. I told her I had just flown my eighty year old mother all across Florida and she loved every minute of it, so with her “Yahoo,” I knew Florence had chosen to believe me. Trust is usually more hard-won.